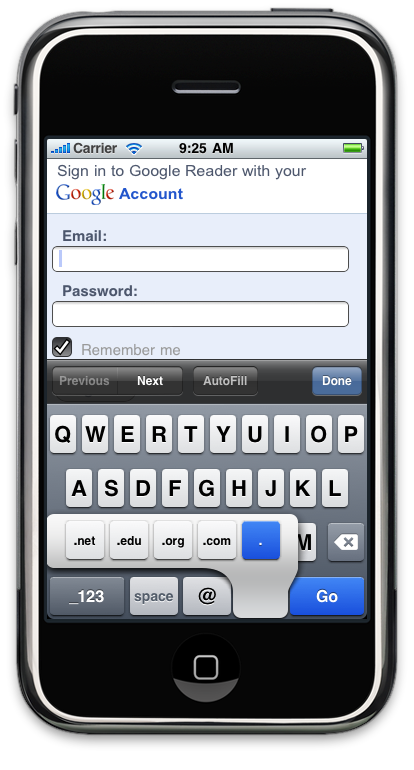 I've been switching between Google Accounts a lot more lately, and it started to bother me that the login page that we show to mobile WebKit browsers doesn't use the email-specific virtual keyboard on iPhones, making it that much more annoying to type in an @ or a .com. The iPhone (as of iPhone OS 3.1) supports using a type="email" attribute on <input> tags, so I changed the login page template to use that. It looks like the change is now live, and I'm pretty sure that this is the thing that I've done that will be seen by the most people (thus far). Of course it doesn't compare with Evan in the characters/user ratio. Awesome. And check out the native UI goodness for type=number, type=email, and type=tel. Works in Opera as well. Always wondered why they hadn't done that yet!